When something goes wrong with the motherboard or logic board of your computer, contact Tech Studio in Mar Vista right away. We can source replacement parts for almost any system, and offer you options to best meet your budget and the needs of your system. We perform our repairs in-house in our own repair shop, rather than sending your machine out to someone else. That saves you time -- and money. Our technicians are trained and experienced in support for both Microsoft and Apple computers, and any additional custom laptop or desktop. When your computer goes down, we understand that you need quick answers and fast repairs, and we work hard to get your computer back up and running as quickly as possible. Unlike intermittent problems with peripheral devices, no computer can run with a malfunctioning motherboard. 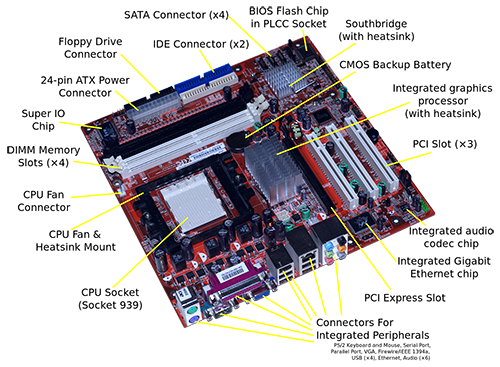 We pay close attention to all the circuitry on your motherboard, and can diagnose the issue when a problem occurs. Our technicians make sure that it is properly operating and connected with all the other components in your computer before returning it to you. Motherboard or logic board failure often feels like the "end" of a computer, for many clients. After this diagnosis, people may imagine the repairs would be too costly, or fear the computer cannot be restored to life after such a serious issue. 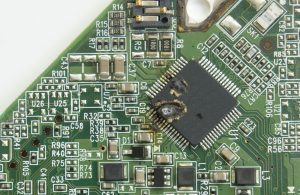 Though it may be best to replace a computer in certain situations, a lot of the time a motherboard or logic board repair proves to be a viable and valuable solution. 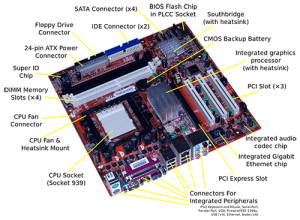 The parts and installation of a motherboard replacement or repair will most likely cost less than replacing the system, either with a new or used unit of a similar model, and you gain a lot of value in having the exact same computer up and running again, where no software has been changed, no data needs to be moved, and all the hardware and functions are in the same familiar place. Replacing a motherboard or logic board will usually be between 20% and 50% of the cost of system replacement, without the time and expense of migrating data and configuring a new computer. Because we perform computer repairs in our own shop, you can be sure that the people you're talking to are the same people who are performing the repairs. Performing computer repairs in house also ensures that we can communicate with you effectively about the timetable and all costs for your repair. Tech Studio Mac and PC Repair takes the time to understand how you use your computer. This helps us to troubleshoot how your computer is supposed to function, and aids us in restoring it to its full potential. Tech Studio has helped over 50,000 customers in the Los Angeles area. When you trust us with your repair or issue, you're getting decades of combined experience to get you back up and running. Some computer repair companies in Los Angeles have friendly staff. Others offer expert service. Tech Studio Mac and PC Repair gives you both. Our friendly and knowledgeable staff members really know computers, but they also love helping customers with their issues and questions. They are not part-time sales people, who do not understand issues such as a malfunctioning motherboard. Contact Tech Studio Mac and PC Repair when you need fast, affordable computer repairs. We're conveniently located at 12417 Woodgreen Street in Los Angeles. Our shop has plenty of free, off-street parking to make getting in and out a cinch.